"I have made this dish for a group of 40. Made sure I did not tell them it was turkey until they asked for the recipe. Everyone could not believe it was turkey. Everyone wants me to make it again. Top with shredded Cheddar cheese alongside Spanish rice and tortilla chips." Mix turkey, bacon, onion, bell pepper, and jalapeno pepper in a baking dish. Bake in preheated oven, stirring occasionally, until the turkey is completely browned and the bacon is crisp, about 15 minutes. Stir kidney beans, black beans, tomatoes, chili powder, cumin, salt, and cayenne pepper together in a large pot; bring to a boil and reduce heat to medium-low. Stir turkey mixture into the beans mixture. 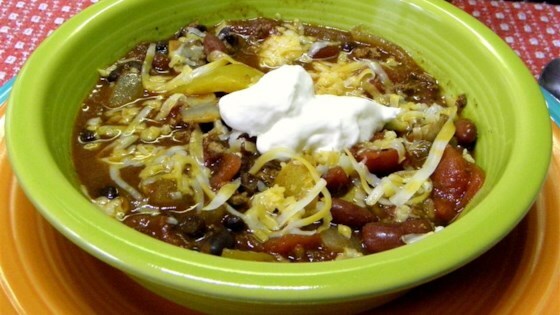 Cook chili at a simmer, stirring occasionally, until the beans are tender, about 40 minutes. HOLY COW! What a surprise! I had not a clue I was eating a turkey 'till maiden aunt Bess told me that uncle Ken shot it fresh the very same afternoon! So zesty and translucent! The bacon added a nice flavor. I added some more tomatoes because I prefer it that way, but it would have been fine without. Yummy! Turkey + Bacon = awesome. Followed the recipe but added pineapples at the end and man that was tasty chili! The smell in the oven reminded me of pizza. Thanks so much for this recipe.